Section 2 of the High Line park officially opened on Wednesday morning, June 8th, 2011, with a notable new material. 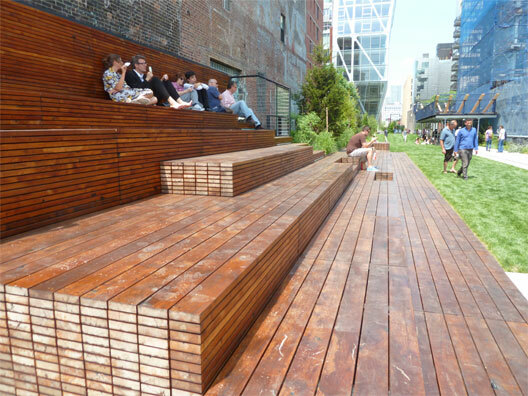 Friends of the High Line, the public benefit corporation that designed the elevated park, constructed seating and decking along the ten-block renovation with reclaimed teak, which had come from old industrial buildings in southeastern Asia. Reclaimed teak is an important departure from the wood that was used along the first segment of the park. There, the decking, benches and bleacher seating are comprised of ipê, a tropical hardwood that had been certified by the Forest Stewardship Council, despite the fact that it was logged from primary forests in the Amazon. 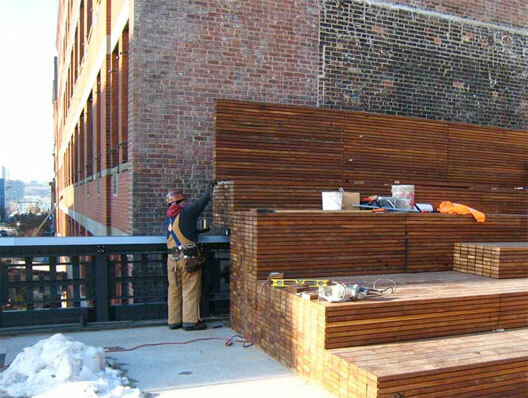 After the first segment of the High Line opened in the summer of 2009, Rainforest Relief and New York Climate Action Group, two metropolitan-based environmental organizations, launched a campaign to convince Friends of the High Line that hardwoods from the Amazon are not sustainable design materials—regardless of whether or not the imported are stamped with the Forest Stewardship Council’s checkmark. They urged Friends to showcase a material that hadn’t been extracted from the world’s remaining rainforests on the next two sections of the High Line. On July 12, 2009, the Brazilian government announced that federal police had broken up a timber-laundering ring in the Amazon involving 3,000 “eco-certified” companies that had been receiving illegal wood for years. FSC-certified companies were among those implicated. Despite the example set by Friends of the High Line, the Parks Department and public benefit corporations of New York City continue to specify wood logged from Amazon for some public parks. Washington Square Park’s 400 new benches are comprised of ipe, as is the decking and benches along the five-miles of Hudson River Park, including Pier 25, which opened this spring.